The morning after Rachel was born Andrew left us at the hospital so that he could take a shower and change his clothes and things like that. 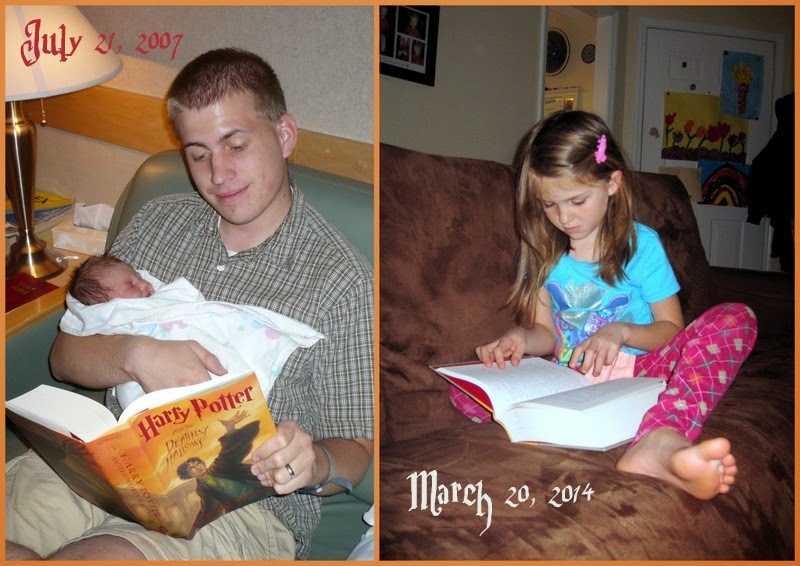 He returned to the hospital carrying a brand-spanking-new copy of Harry Potter and the Deathly Hallows. He carefully lifted Rachel out of her little bassinet and settled on the couch (where he'd spent the night) with two of his newest loves announcing, "This is happiness." I took a nap. This morning I woke up to the alarm at 8:00. We'd decided last night that Rachel would be a car-rider since Andrew didn't have to be on campus today (but don't worry he was on campus for +/- twelve hours on Tuesday and Wednesday and then came home and did hours of study/research each evening (grad school is so much fun)). "Rachel's already awake!" I said with wonderment. I could see her sitting on the couch reading—as usual—from where I was in the bed. "And she's already dressed!" "Rachel, go eat breakfast," Andrew urged. "I already ate," she chirped. She'd also already done her hair, brushed her teeth, and packed up her backpack. She read until it was time to leave for school and then she threw on her clogs (we usually just call them 'crocs' but I've developed a sort of brand loyalty to Little Laces, which is the brand of her crocs/clogs (crocs have become the kleenex of clogs, I'm afraid)) and a sweater and raced out the door, book in hand, to read in the car. She is nearly finished with book seven and is dying to get to the end. I remember feeling the same way. I read it right after Andrew finished it, when Rachel was still just a tiny baby and post-pregnancy hormones were ravaging my body. When Rachel came into our bedroom to continue her death count (she has to come discuss each death with us) she said, "Fred got stunned. Or killed. I'm not sure which. And now Snape's dead." "Are you a robot?!" I gasped. I cried so many tears over that book. So. Many. Tears. But the vast majority of those tears could probably be written off as post-baby tears (kind of like pregnancy tears but a little different). Anyway, who'd have thought that less than seven years after reading that book for the first time, Rachel would be sitting down with it as well? She's absolutely captivated by the story. It's all she can talk about (especially since so many difficult things happen in the later books) so it's all we talk about as well. And who'd have thought she'd ever get herself up in the morning and get completely ready for the day all on her own?! I was so impressed—even if I did forget to turn off her bus-alarm when I turned on her car-alarm, making her get up an hour earlier than anyone else. She obviously didn't mind her early wake-up call. She's going to finish this book today. And then what is she going to do, huh, JK Rowling? What is she going to do?! It wasn't just pregnant hormones. I've cried every time I read book seven. It is the Snape part that always gets me every time. I love the picture comparison!